I did tell you I was on a roll didn’t I? Weeks of very little from me, then suddenly I just can’t seem to shut up about the things I’ve made and done! 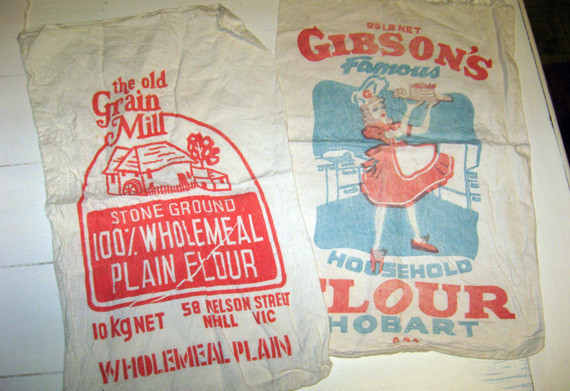 Do you remember when I found a ton of old cotton flour and bank deposit bags at an op shop ages ago? Most of them are from the 80s, but that one with the woman holding a cake on it is in pounds so I figure it has to be from the 60s before Australia went metric. At first I thought I wanted to make cushion covers out of them, but some are pretty old and the shape doesn’t really lend itself to a cushion unless you trim the image (no way) or lie the cushion sideways (not ideal). 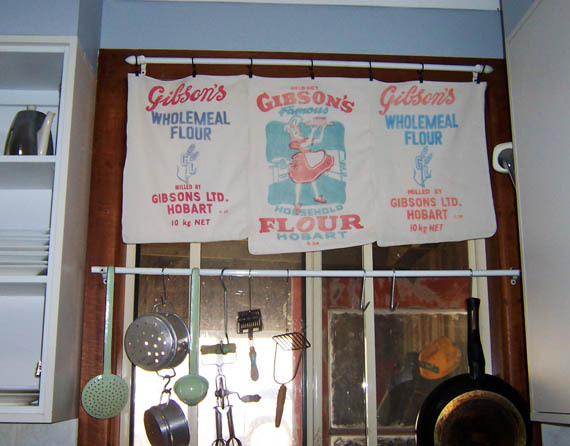 I also thought they’d make great (interesting) curtains for my ugly kitchen. A talking point type of thing, if you will. So first thing I did was sort out how many bags I’d need for each window. I have two windows in the kitchen. One is tall and narrow, the other is tall and a bit wider. The first looks out to the front yard but is positioned in such a way that you cant really see out of it much, sandwiched as it is between the cupboards holding the microwave and the stove/rangehood. The bigger one looks out into the mud room now that we’ve enclosed that tiny porch. 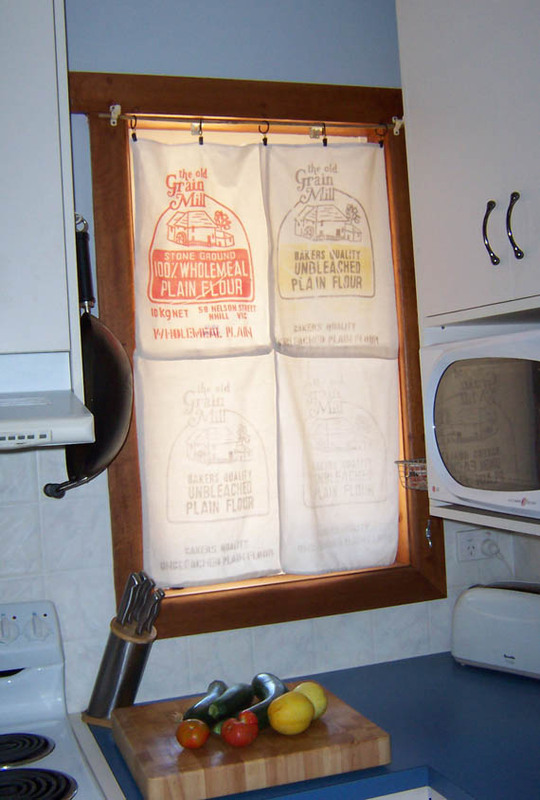 The tall narrow window gets the full HOT afternoon sun and had a venentian blind on it… very necessary if you didn’t want the kitchen to become a furnace on days like today. However the venetian blind was broken and I wanted it gone. Using some small curtain clips I’d bought from ebay (cause the only place I found them locally was insanely expensive) I suspended them from the window sill using some old curtain hooks and a stick of bamboo I ripped out of a screen…. Ok. I didn’t have a curtain rod which would fit so I improvised! On the other side of the room I had put up a hanging rail to hold the frying pans and some totally useless/display only bits and pieces. 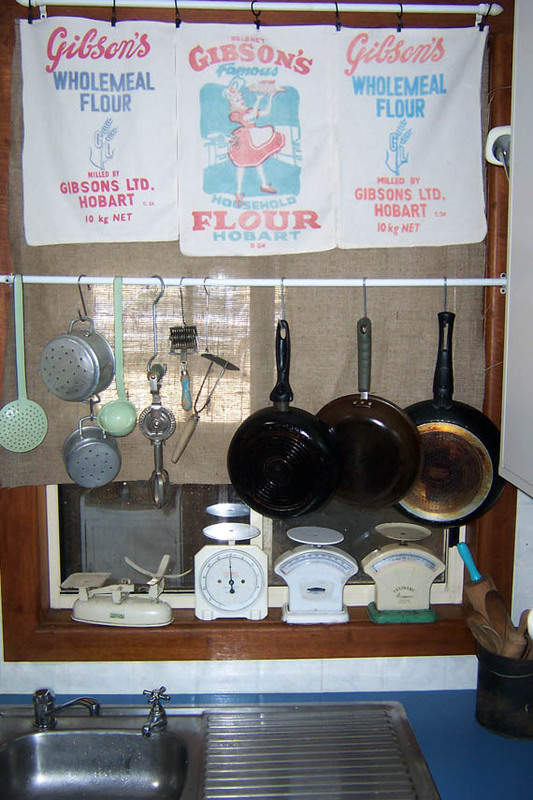 I only needed a short curtain to cut out some of the glare but still allow us to look out the window to the front gate if we bent over the sink, leaned to the left and carefully pressed our faces to the window all while avoiding braining ourselves on the sharp cupboard corner. Don’t you love the layout of our kitchen? I know Wayne does. You’ll recognise him. He’s the one with the band aids all over his head. The main problem, as you can see on the narrow window, is that the curtain looked see-through with the strong sun behind it. I couldn’t leave it like that. Not in this heat. So I grabbed this girl’s best friend – burlap! 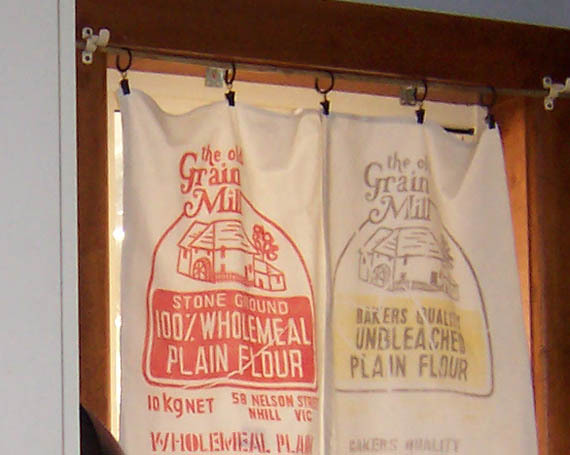 I cut a piece of burlap slightly larger than the flour sack curtain I’d made, clipped it all together and voila! Much better! 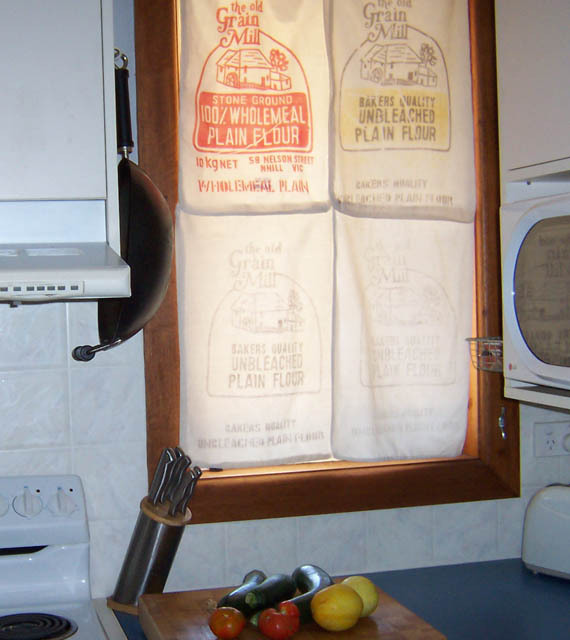 I did the same with the other window too, only this time I cut the burlap longer so it would go behind the rail and cover a bit more of the unsightly mess in the mud room. Not bad for an almost no sew project. Basic and easy. This entry was posted in DIY, Renovating, thrifting by zefiart. Bookmark the permalink. Love the curtains! I think those bags are so much fun. I wish companies still made them like that. 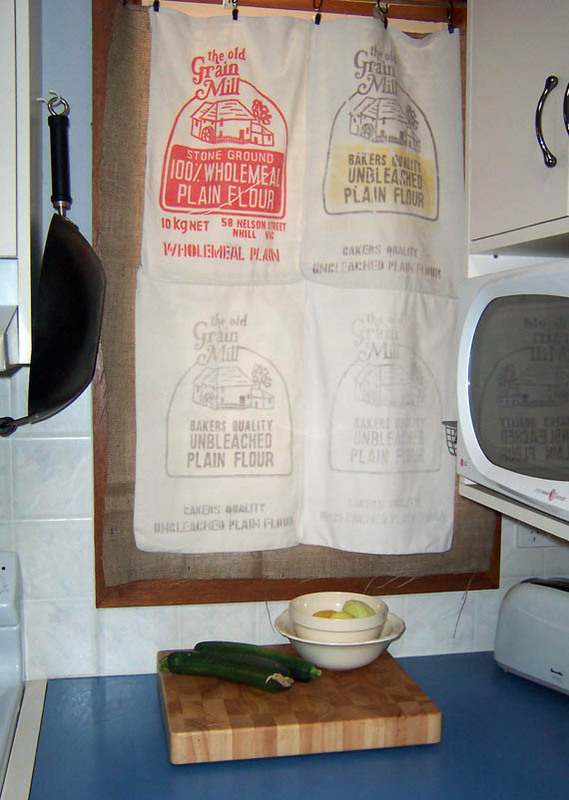 A few years ago, my aunt was gifted with a giant box of floral flour sacks. Her cousin found the box in the hayloft in their Nebraska(USA) barn. My aunt managed to make 2 quilts for grandsons and about 2 dozen towels each for me and her daughter in law. I always keep my eye open for them. 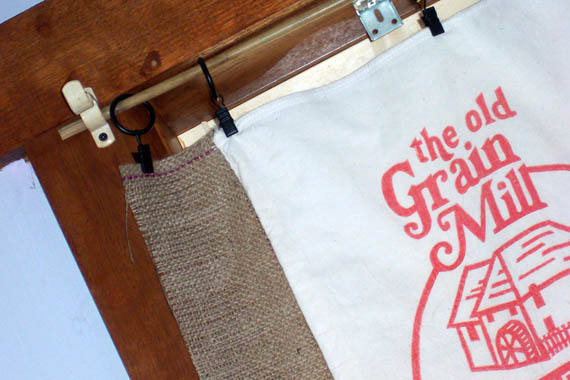 Great idea with the burlap. We get some wicked hot sun in summer, as well. Tho' right now we're having a big snowfall. What a cute idea for a kitchen! 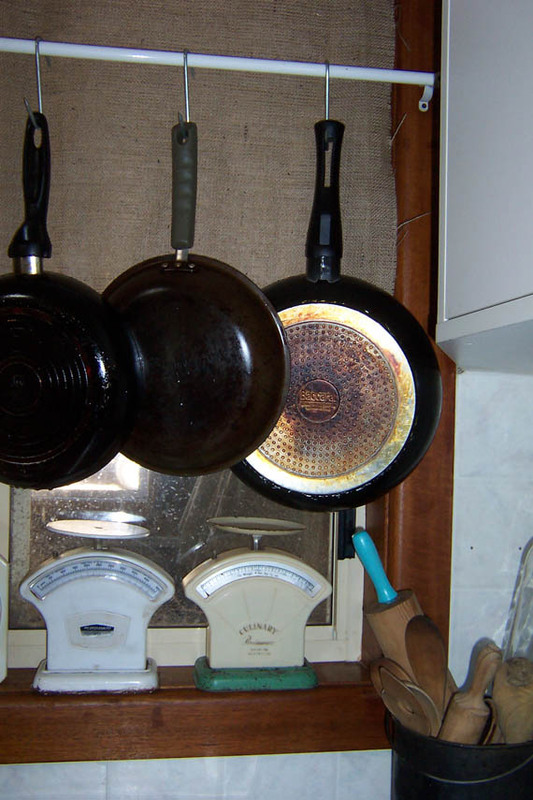 Love that you repurposed everything too. I understand about layout problems too. Some days I just want to bulldoze our house to the ground and start all over! 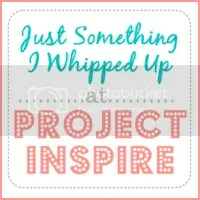 Thank you for sharing it at What We Accomplished Wednesdays! Have a great weekend! I love the quilt idea! And I'd love to see what else you (or your aunt) make out of flour sacks! Dear Zefi, You can tell that I have old-fashioned ideas about note-writing; when I address you as “Dear”. I also believe that the greeting is lovely and friendly. 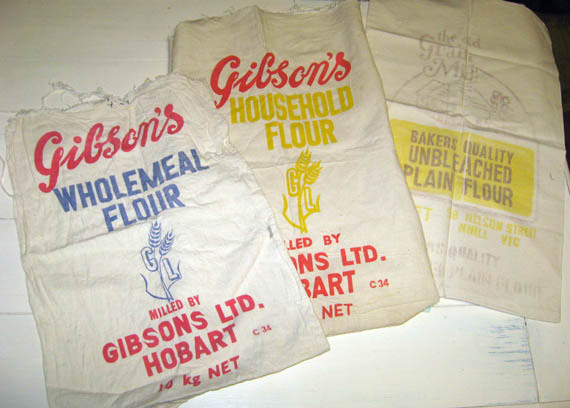 First of all, I NEVER see flour sacks, but I do remember them; and I covet yours. I understand about the kitchen not being what you would like-all the photos show that you make the best of what you have being the creative hen that you are. 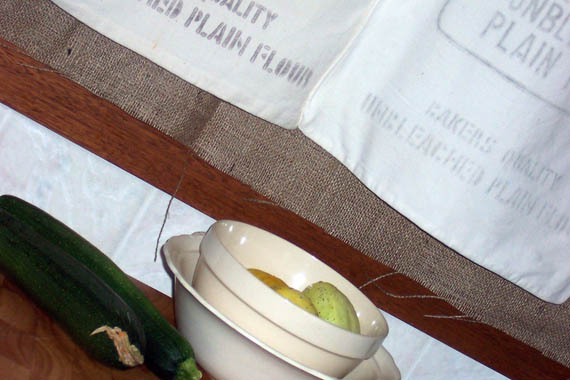 The burlap facing outside, then the flour sacks makes sense in that the burlap will lengthen the flour sacks life. I love your blog. Dear Beadhen, with modern technology we lose the old fashioned politeness, don't we? And its all about preserving old things, even when we alter them! Cause who knows? In a while they may be reincarnated into something else again! Do you have a blog? I looked on your profile and all I saw was 2 blogs you follow. Please send a link. I'd like to see what you do.